Decades ago Mild French came from Porter and Sons Nursery in Stephenville, Texas who grew it and sold it through their catalog for years so it has a history of having been successfully grown in moderate winter areas. This is likely the fabled "Texas White" that no one has seen for decades. 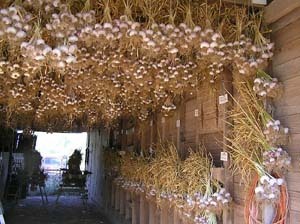 Porter and Sons are gone now and I decided to bring their garlic back to Texas and my test crop of it grew well and I harvested some nice large clean healthy bulbs so I am encouraging others to grow this excellent long storing garlic. As with many silverskins its bulb wrappers are thick and creamy white. The cloves; however, are a beautiful mahogony color with elongated tips. Bulbs can become large for a silverskin and contain 15 or more cloves. Mild French makes an excellent braider and has a taste as bold as its looks. It has the full flavored musky character typical of Silverskins yet with only moderate pungency (hotness) during the fall and full flavored in the winter but as time passes it gets hotter so that in the spring it is quite hot and strong. Silverskins are the last garlics to mature and be harvested (July to August even in the south) and Mild French is one of the first Silverskins to be harvested. Growing late harvesting, long storing silverskins as well as early harvesting, shorter storing Artichokes, Asiatics or Turbans may mean you never run out of good garlic. It should grow well over most of the south but probably "iffy" along the gulf coast.